The 382th Plenary Meeting of the Polish Episcopate Conference, dedicated to the centennial of the Bishops' Conference and the restoration of diplomatic relations between Poland and the Apostolic Capital, continues in the capital of neighboring Poland, Warsaw. Representatives of local churches from different countries of Europe participated in the solemnity, including: Slovakia, Sweden, Spain, Belarus, Latvia, Moldova and others. The Roman Catholic Church in Ukraine was represented by Bishop Yan Sobilo, Auxiliary Bishop of the Kharkiv-Zaporizhzhya diocese of the RCC, who informed all those present about the social and religious situation in Ukraine. Bishop Bohdan Dziurakh, secretary of the Synod of Bishops of the UGCC, was the formal representative of the Ukrainian Greek Catholic Church and delegate of His Beatitude Sviatoslav at the solemn meeting. During his address to the Polish bishops and their guests, Bishop Bohdan congratulated those in attendance on behalf of the Father and the Head of the UGCC and the entire episcopate of the UGCC. In addition, he presented to the President of the Polish Bishops' Conference Archbishop Stanislav Gondetsky, a letter of congratulations from the Primate of the Ukrainian Greek Catholic Church. In his speech, the representative of the UGCC described the social and ecclesiastical situation in Ukraine. In particular, he spoke of the humanitarian crisis caused by the aggression of the Russian Federation against Ukraine. Bishop Bohdan thanked the Polish bishops for the acts of solidarity that the Ukrainian people and the Catholic communities of both rites received from their brothers and sisters in faith in Poland since the beginning of dramatic events in the East of Ukraine. "Letters of solidarity, visits by Polish bishops to Ukraine, humanitarian aid, and above all a constant prayer for peace in Ukraine - all these are sure evidence of human and Christian intimacy and a sign of hope and a guarantee of the ultimate victory of good and love over the forces of hatred and evil," said the Secretary of the Synod of Bishops of the UGCC. Separately, the Bishop thanked the Polish bishops for their pastoral support and care of Ukrainian migrant workers who are currently in Poland. "These people came to Poland in search of a means for survival. Thanks to the open hearts of the people and the Catholic churches, through the creative cooperation of our bishops, we can help them gain an experience of meeting the Living God, Who is Love," summed up the representative of the UGCC. 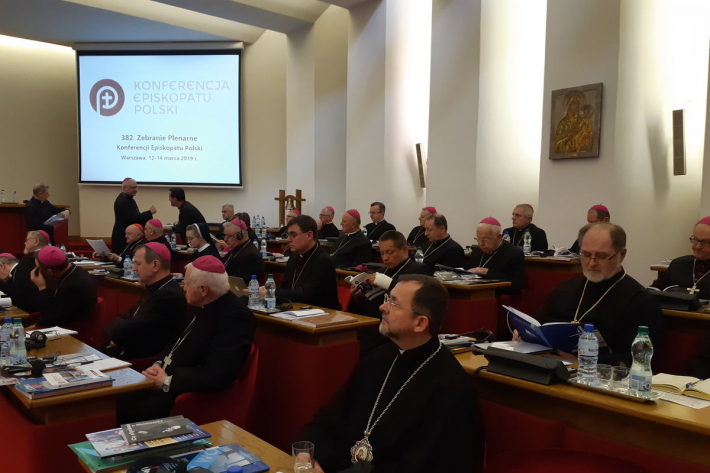 We wish to inform you that the Polish Bishops' Conference consists of 154 bishops, including members of the Synod of Bishops of the Ukrainian Greek Catholic Church: Archbishop Yevhen (Popovych), Metropolitan of Przemyśl-Warsaw; Eparch of Wrocław- Gdańsk Volodymyr (Yuschak), and the Honorable Metropolitan of Przemyśl-Warsaw Ivan (Martyniak), who carry out their episcopal ministry in Poland.